↑ Anthony, John W.; Bideaux, Richard A.; Bladh, Kenneth W.; Nichols, Monte C., eds. (2000). 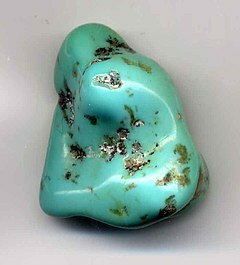 "Turquoise". Handbook of Mineralogy (PDF). IV (Arsenates, Phosphates, Vanadates). Chantilly, VA, US: Mineralogical Society of America. ISBN 0962209732.